In biology, precocial species are those in which the young are relatively mature and mobile from the moment of birth or hatching. The opposite developmental strategy is called "altricial", where the young are born or hatched helpless. These categories form a continuum, without distinct gaps between them. Precocial species are normally nidifugous, meaning that they leave the nest shortly after birth or hatching. 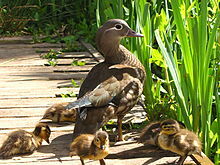 A Mandarin duck (Aix galericulata) and her ducklings. Like other anseriformes, ducks are precocial animals; within two hours of hatching, the ducklings are normally led to the nearest area of water. The span between precocial and altricial species is particularly broad in birds. Precocial birds hatch with their eyes open and are covered with downy feathers that are soon replaced by adult-type feathers. Birds of this kind can also swim and run much sooner after hatching than altricial young, such as songbirds. Very precocial birds can be ready to leave the nest in a short period of time following hatching (e.g. 24 hours). 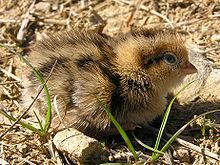 Many precocial chicks are not independent in thermoregulation (the ability to regulate their own body temperatures), and they depend on the attending parent(s) to brood them with body heat for a short period of time. Precocial birds find their own food, sometimes with help or instruction from the parents. Examples of precocial birds include the domestic chicken, many species of ducks and geese, waders, rails, and the hoatzin. Horses are known for being precocial, and foals can walk as fast as their parents within hours. Precociality is found in many other animal groups. Familiar examples of precocial mammals are most ungulates, the guinea pig, and most species of hare. This last example is significant as it illustrates that precociality is not a particularly conservative characteristic, in the evolutionary sense, since the closely related rabbit is highly altricial. Precocial species typically have a longer gestation or incubation period than related altricial species, and smaller litters or clutches, since each offspring has to be brought to a relatively advanced (and large) state before birth or hatching. The phenomenon of imprinting studied by Konrad Lorenz is characteristic of precocial birds. Extremely precocial species are called "superprecocial". Examples are the megapode birds, which have full flight feathers and which, in some species, can fly on the same day they hatch from their eggs. Another example is the blue wildebeest, whose calves can stand within an average of six minutes from birth and walk within thirty minutes; they can outrun a hyena within a day. Such behavior gives them an advantage over other herbivore species; they are 100 times more abundant in the Serengeti ecosystem than hartebeests, their closest taxonomic relative. Hartebeest calves are not as precocial as wildebeest calves and take up to thirty minutes or more before they stand, and as long as forty-five minutes before they can follow their mothers for short distances. They are unable to keep up with their mothers until they are more than a week old. Look up precocial in Wiktionary, the free dictionary. The word "precocial" is derived from the same root as precocious, implying in both cases early maturity. Precociality is thought to be ancestral in birds. Thus, altricial birds tend to be found in the most derived groups. There is some evidence for precociality in protobirds and troodontids. ^ a b Edward S. Brinkley (2000). Creatures of the Air and Sea. Singapore: Reader's Digest Children's Books. pp. 34, 35. ISBN 0-7944-0353-0. ^ Webster's New World Dictionary. David B. Guralnik, Editor in Chief. New York: Simon & Schuster, 1984. ^ Elzanowski, Andrzej; Brett-Surman, Michael K. (July 1995). "Avian Premaxilla and Tarsometatarsus from the Uppermost Cretaceous of Montana". The Auk. 112 (3): 762–67. JSTOR 4088693. ^ Varricchio, David J.; Horner, John R.; Jackson, Frankie D. (September 19, 2002). "Embryos and eggs for the Cretaceous theropod dinosaur Troodon formosus". Journal of Vertebrate Paleontology. 22 (3): 564–76. doi:10.1671/0272-4634(2002)022[0564:EAEFTC]2.0.CO;2. JSTOR 4524250.